One flower I enjoy using this time of year is the snapdragon. 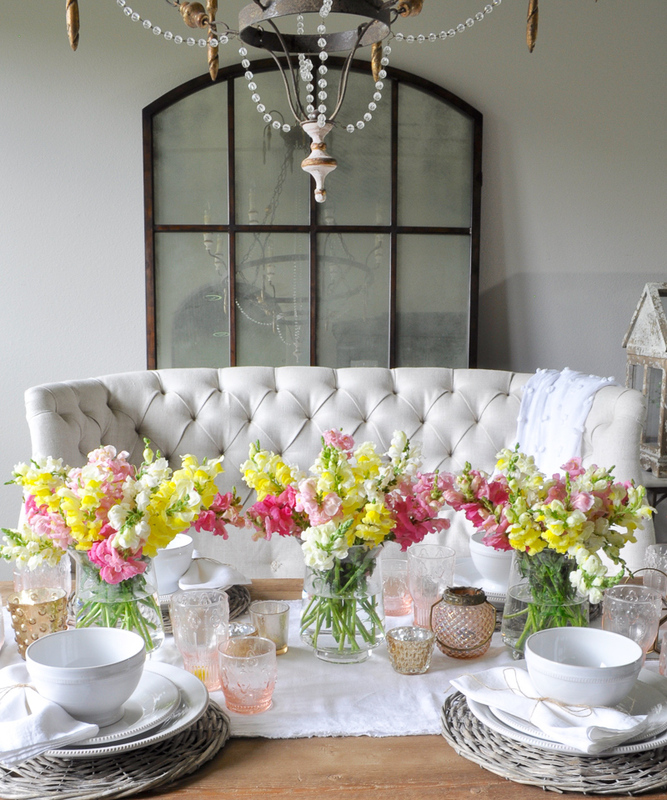 Spring allows us to incorporate a vast amount of colors in a variety of ways. This particular flower is easy to use throughout your home. 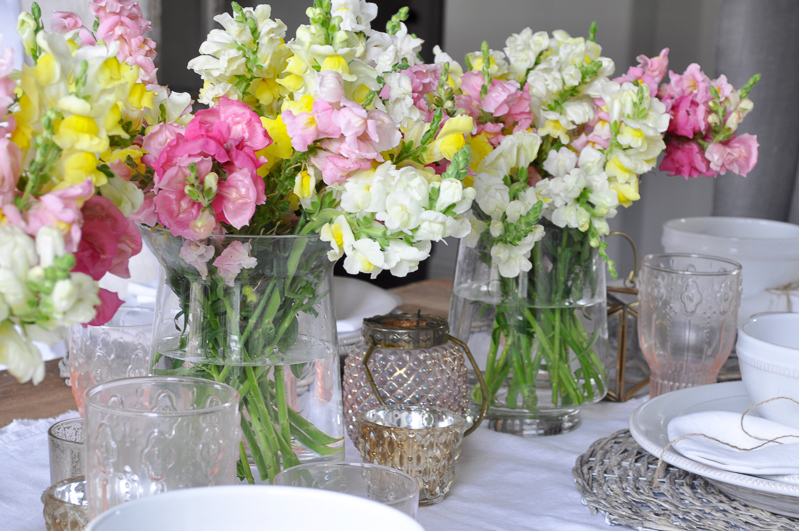 Whether it is a simple dining table or in a vase on your kitchen counter, be sure to add one or more of the varieties of snapdragons into your design scheme for a lovely spring adornment. Try gathering a dozen or more of them and place them in a small vase and you will create one of the prettier bouquets you will find. The result will certainly be a hit with your family and guests alike. As mentioned above, the blooms on this flower offer so many color variations that you are sure to find one or several that suit your personal taste. 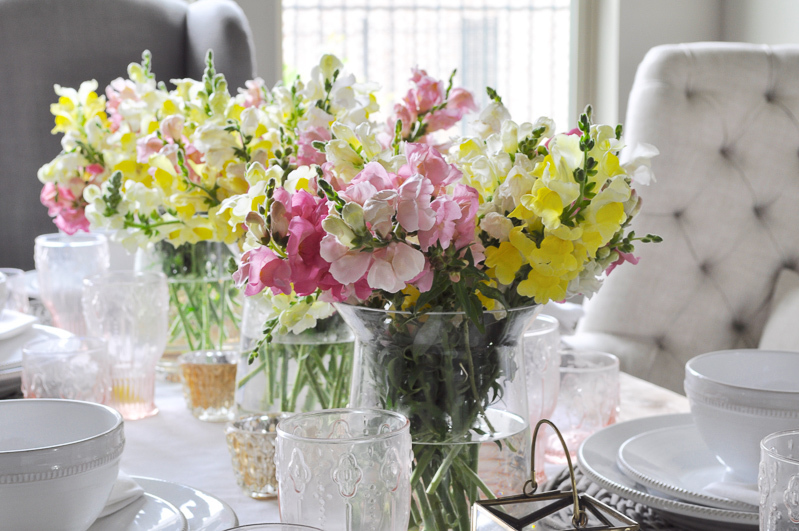 Snapdragons come in a variety of pinks, yellows, and white (and many more soft colors)…all perfect for my spring table! 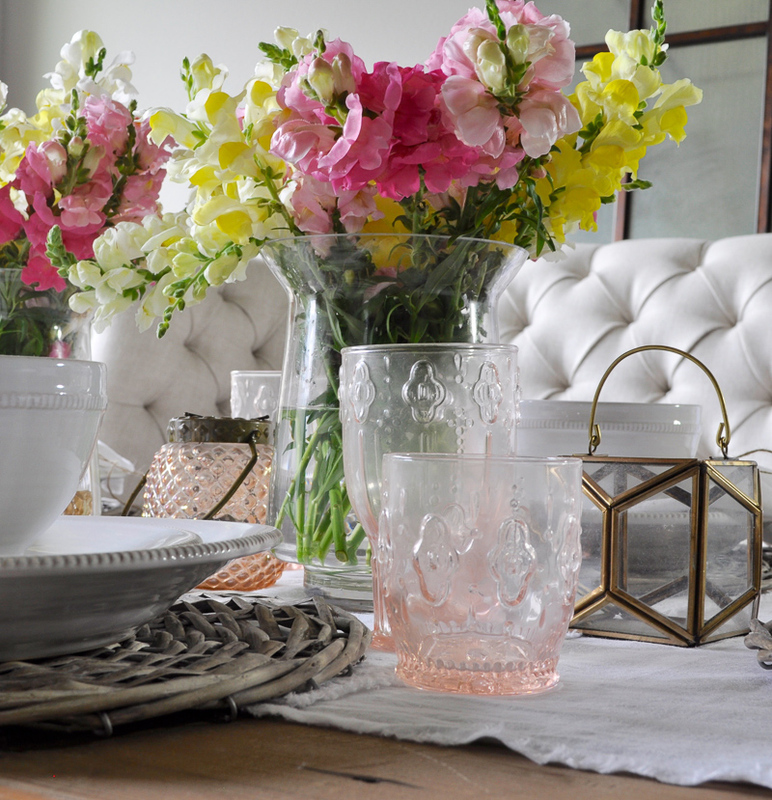 For my tablescapes I always begin with the centerpiece, so with this ruffly flower, I had the perfect starting point. My main goal was to create something that anyone could duplicate, so I started by simply filling three matching vases full of stems. I love the transparency of a glass vase. You can read more about this versatile item here. After the centerpiece, I chose the glassware. 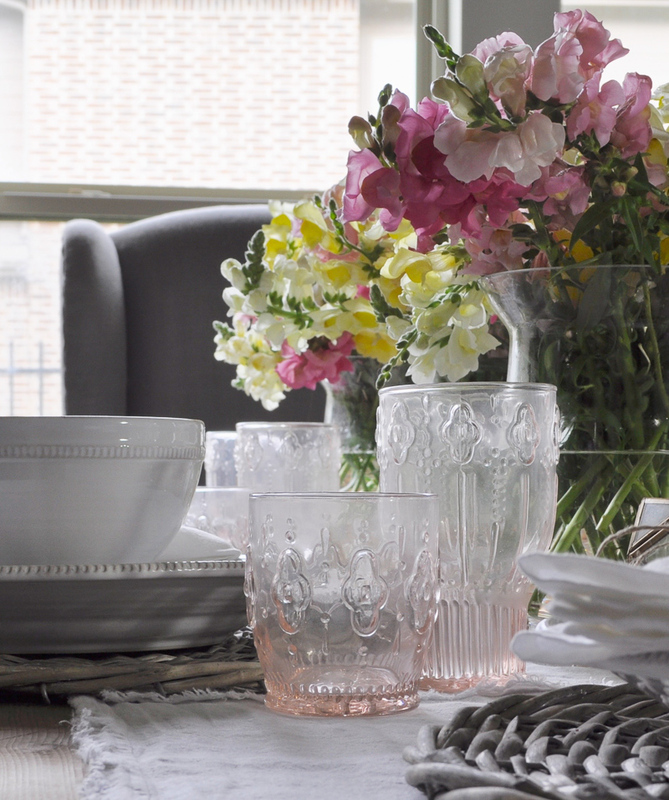 Seeing the world through rose colored glasses is easy when you add these lovely ones like these to your spring table setting. I almost always use all white dishes and they were the perfect choice for this. 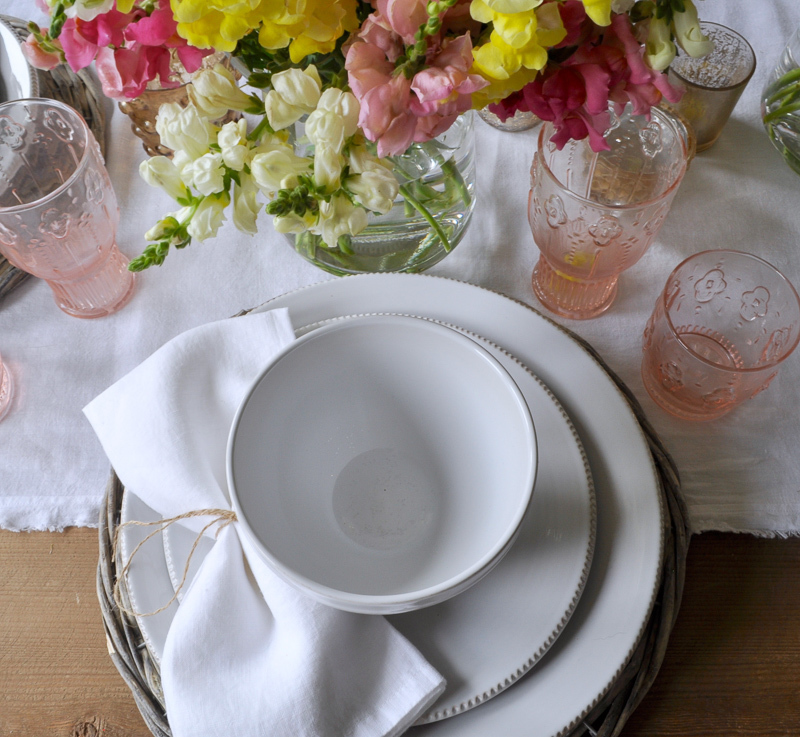 Nothing is fresher or more beautiful than lightweight linen on your spring table. I chose a runner and napkins in white. 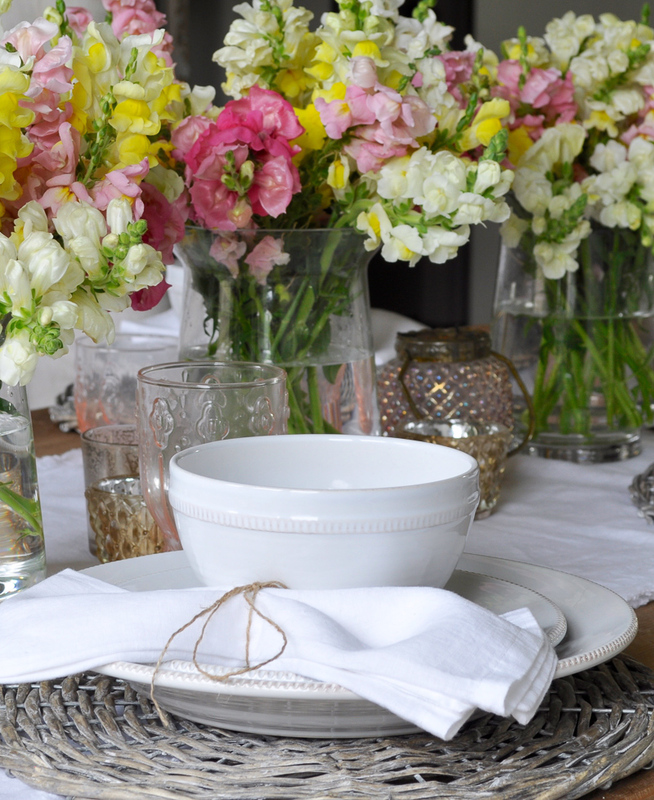 There are many ways to style your napkins. 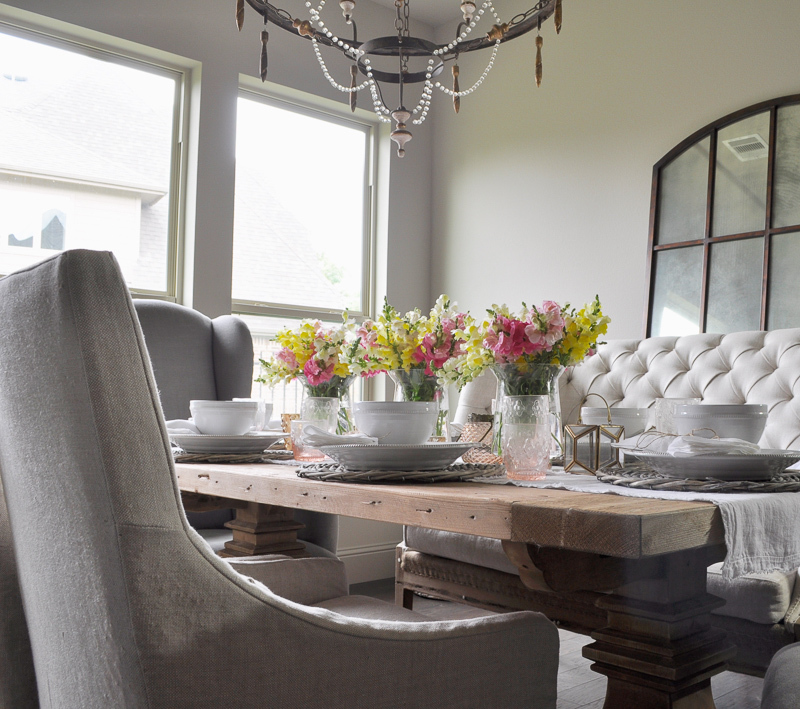 I often like to add a single flower, but for this table, I wanted the overflowing vases to be the star, so I simply tied them with twine and placed them on the plates at a diagonal. For a finishing touch, I scattered a few votives and lanterns around the table. They are especially nice in the evening if you prefer a candlelit table. 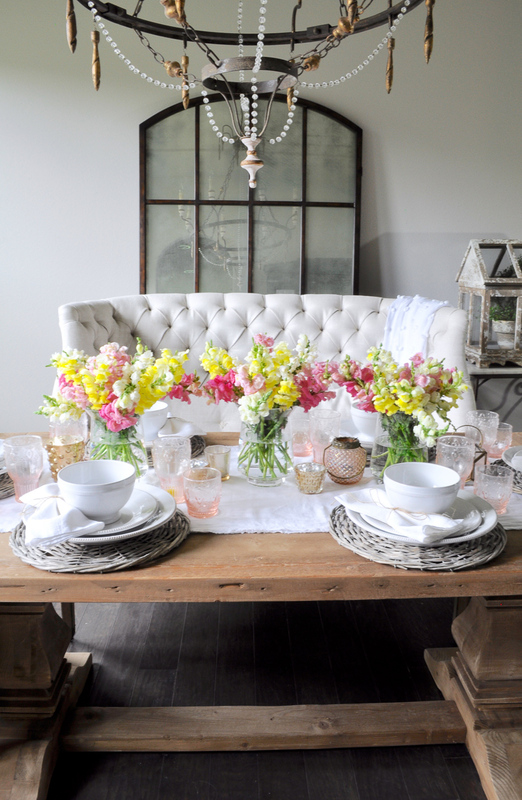 With Easter behind us and Mother’s Day a few weeks ahead, I was pleased to give my table a fresh spring setting. Shop the look below. Some affiliate links were used. Thank you for visiting. 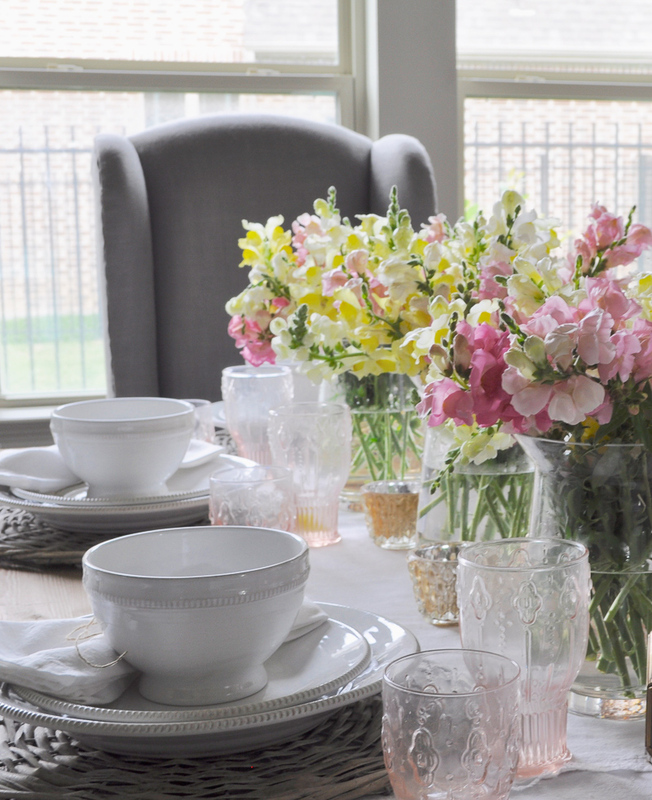 I hope you enjoyed my spring tablescape. As you can probably tell, I love creating them. You can see my Easter and Valentine’s ones here and here. All of my photos can be easily shared on Pinterest by clicking the button on the shot. Also, please consider subscribing so as not to miss out on any future posts and decorating tips! Visit my Sources page for additional furnishings. Snapdragons are one of my favorites, too. 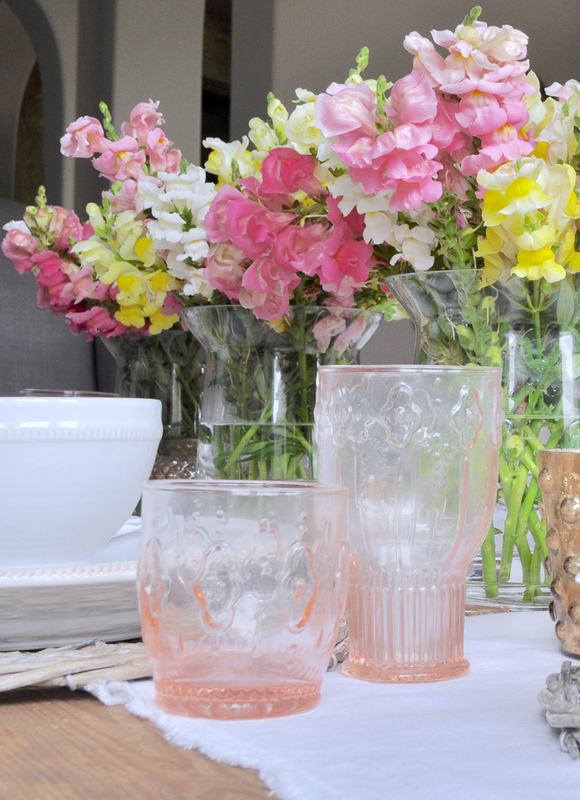 They’re perfect with your beautiful neutral decor! I love them too! Thank you so much Elise! Thank you Traci! We need to catch up soon!!! Hi Nicole! 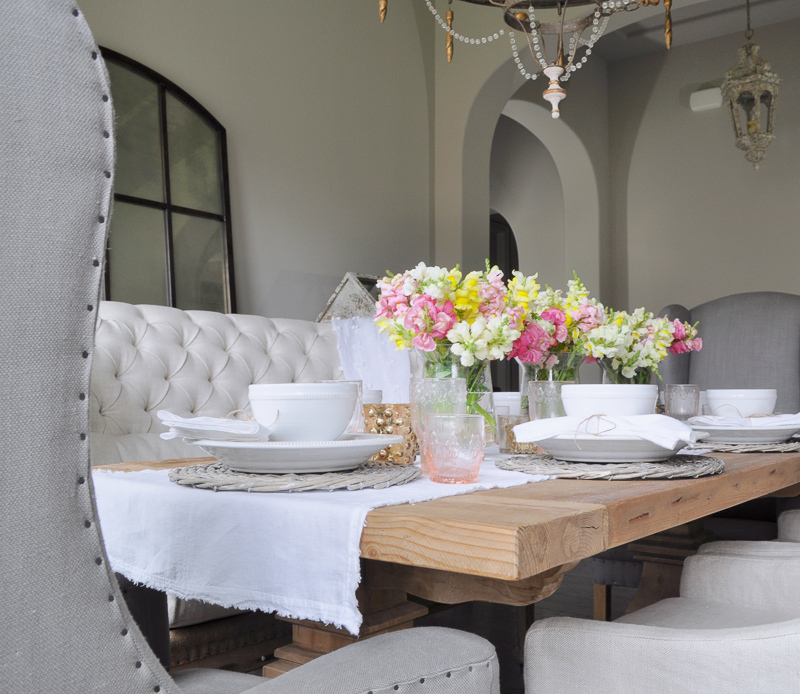 You can find all sources here https://www.decorgolddesigns.com/dining-room/ Thanks for stopping by!